Roger Goodell - yes the NFL commissioner could be a thorn in the side of brand NFL. With an approval rating of 39% among NFL players and a lack of transparency glossed over with corporate speak, Goodell might serve the NFL better by stepping aside. The Referees - first there was the labor dispute. Why the NFL thought that showcasing the world's best players in competitions governed by replacement officials was somehow acceptable is difficult to understand. If you position your brand as the best in the world then everything about it should be the best in the world. Even the officiating crew for this year's Super Bowl is not without controversy. On-Field Violence - how do you satisfy the bloodlust of the overweight beer drinker who wallows away his Sundays with NFL games while protecting players on the field? Add to that players who play (and may be trained) to hurt people. Well, after 90 some years - the NFL is still figuring that out. Off-Field Violence - from murder-suicides to manslaughter it has been a tragic year for the NFL off the field. With a little under 1,700 players and an average salary just shy of $2 million, has the NFL truly exhausted all the support processes for its players? Ray Lewis - the star linebacker's pending retirement coupled with his team's march to the Super Bowl this year seems to be the chosen narrative for Super Bowl XLVII. Should it be? From murder and mayhem to baby momma drama to deer antler spray, is Ray Lewis truly a brand ambassador the NFL wants to embrace? Maybe we should hold up these guys as examples, instead. Enough football talk. 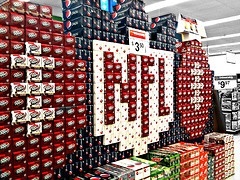 You see the risks to the NFL brand, but what about the risks to your brand? Even if you're a small company without the exposure of the NFL you still have a brand to build and maintain. Are there employees or processes or even clients that put your brand at risk? More importantly, how are you addressing these risks?